For any other use, see Crust (disambiguation). In geology, the crust is the outermost solid shell of a rocky planet, dwarf planet, or natural satellite. It is usually distinguished from the underlying mantle by its chemical makeup; however, in the case of icy satellites, it may be distinguished based on its phase (solid crust vs. liquid mantle). The crusts of Earth, Moon, Mercury, Venus, Mars, Io, and other planetary bodies formed via igneous processes, and were later modified by erosion, impact cratering, volcanism, and sedimentation. Most terrestrial planets have fairly uniform crusts. Earth, however, has two distinct types: continental crust and oceanic crust. These two types have different chemical compositions and physical properties, and were formed by different geological processes. Planetary geologists divide crust into three categories, based on how and when they formed. This is a planet's "original" crust. It forms from solidification of a magma ocean. Toward the end of planetary accretion, the terrestrial planets likely had surfaces that were magma oceans. As these cooled, they solidified into crust. This crust was likely destroyed by large impacts and re-formed many times as the Era of Heavy Bombardment drew to a close. The nature of primary crust is still debated: its chemical, mineralogic, and physical properties are unknown, as are the igneous mechanisms that formed them. This is because it is difficult to study: none of Earth's primary crust has survived to today. Earth's high rates of erosion and crustal recycling from plate tectonics has destroyed all rocks older than about 4 billion years, including whatever primary crust Earth once had. However, geologists can glean information about primary crust by studying it on other terrestrial planets. Mercury's highlands might represent primary crust, though this is debated. The anorthosite highlands of the Moon are primary crust, formed as plagioclase crystallized out of the Moon's initial magma ocean and floated to the top; however, it is unlikely that Earth followed a similar pattern, as the Moon was a water-less system and Earth had water. The Martian meteorite ALH84001 might represent primary crust of Mars; however, again, this is debated. Like Earth, Venus lacks primary crust, as the entire planet has been repeatedly resurfaced and modified. Secondary crust is formed by partial melting of silicate materials in the mantle, and so is usually basaltic in composition. This is the most common type of crust in the Solar System. Most of the surfaces of Mercury, Venus, Earth, and Mars comprise secondary crust, as do the lunar maria. On Earth, we see secondary crust forming primarily at mid-ocean spreading centers, where the adiabatic rise of mantle causes partial melting. The only known example of tertiary crust is the continental crust of the Earth. It is unknown whether other terrestrial planets can be said to have tertiary crust, though the evidence so far suggests that they do not. This is likely because plate tectonics is needed to create tertiary crust, and Earth is the only planet in our Solar System with plate tectonics. 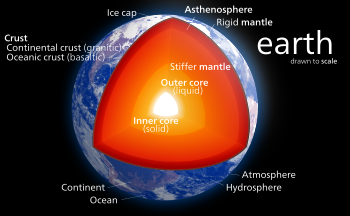 The crust is a thin shell on the outside of the Earth, accounting for less than 1% of Earth's volume. It is the top component of lithosphere: a division of Earth's layers that includes the crust and the upper part of the mantle. The lithosphere is broken into tectonic plates that move, allowing heat to escape from the interior of the Earth into space. The crust lies on top of the mantle, a configuration that is stable because the upper mantle is made of peridotite and so is significantly denser than the crust. The boundary between the crust and mantle is conventionally placed at the Mohorovičić discontinuity, a boundary defined by a contrast in seismic velocity. Oceanic: 5 km (3 mi) to 10 km (6 mi) thick and composed primarily of denser, more mafic rocks, such as basalt, diabase, and gabbro. Continental: 30 km (20 mi) to 50 km (30 mi) thick and mostly composed of less dense, more felsic rocks, such as granite. Because both continental and oceanic crust are less dense than the mantle below, both types of crust "float" on the mantle. This is isostasy, and it's also one of the reasons continental crust is higher than oceanic: continental is less dense and so "floats" higher. As a result, water pools in above the oceanic crust, forming the oceans. The temperature of the crust increases with depth, reaching values typically in the range from about 200 °C (392 °F) to 400 °C (752 °F) at the boundary with the underlying mantle. The temperature increases by as much as 30 °C (54 °F) for every kilometer locally in the upper part of the crust, but the geothermal gradient is smaller in deeper crust. The continental crust has an average composition similar to that of andesite. The most abundant minerals in Earth's continental crust are feldspars, which make up about 41% of the crust by weight, followed by quartz at 12%, and pyroxenes at 11%. Continental crust is enriched in incompatible elements compared to the basaltic ocean crust and much enriched compared to the underlying mantle. Although the continental crust comprises only about 0.6 weight percent of the silicate on Earth, it contains 20% to 70% of the incompatible elements. Earth formed approximately 4.6 billion years ago from a disk of dust and gas orbiting the newly formed Sun. It formed via accretion, where planetesimals and other smaller rocky bodies collided and stuck, gradually growing into a planet. This process generated an enormous amount of heat, which caused early Earth to melt completely. As planetary accretion slowed, Earth began to cool, forming its first crust, called a primary or primordial crust. This crust was likely repeatedly destroyed by large impacts, then reformed from the magma ocean left by the impact. 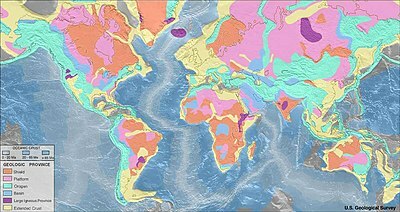 None of Earth's primary crust has survived to today; all was destroyed by erosion, impacts, and plate tectonics over the past several billion years. Since then, Earth has been forming secondary and tertiary crust. Secondary crust forms at mid-ocean spreading centers, where partial-melting of the underlying mantle yields basaltic magmas and new ocean crust forms. This "ridge push" is one of the driving forces of plate tectonics, and it is constantly creating new ocean crust. That means that old crust must be destroyed somewhere, so, opposite a spreading center, there is usually a subduction zone: a trench where an ocean plate is being shoved back into the mantle. This constant process of creating new ocean crust and destroying old ocean crust means that the oldest ocean crust on Earth today is only about 200 million years old. In contrast, the bulk of the continental crust is much older. The oldest continental crustal rocks on Earth have ages in the range from about 3.7 to 4.28 billion years  and have been found in the Narryer Gneiss Terrane in Western Australia, in the Acasta Gneiss in the Northwest Territories on the Canadian Shield, and on other cratonic regions such as those on the Fennoscandian Shield. Some zircon with age as great as 4.3 billion years has been found in the Narryer Gneiss Terrane. ^ a b Hargitai, Henrik (2014). "Crust (Type)". Encyclopedia of Planetary Landforms. Springer New York. pp. 1–8. doi:10.1007/978-1-4614-9213-9_90-1. ISBN 9781461492139. ^ Chambers, John E. (2004). "Planetary accretion in the inner Solar System". Earth and Planetary Science Letters. 223 (3–4): 241–252. Bibcode:2004E&PSL.223..241C. doi:10.1016/j.epsl.2004.04.031. ^ Taylor, Stuart Ross (1989). "Growth of planetary crusts". Tectonophysics. 161 (3–4): 147–156. Bibcode:1989Tectp.161..147T. doi:10.1016/0040-1951(89)90151-0. ^ a b c 1925–, Taylor, Stuart Ross (2009). Planetary crusts : their composition, origin and evolution. McLennan, Scott M. Cambridge, UK: Cambridge University Press. ISBN 978-0521841863. OCLC 666900567. ^ Taylor, G. J. (2009-02-01). "Ancient Lunar Crust: Origin, Composition, and Implications". Elements. 5 (1): 17–22. doi:10.2113/gselements.5.1.17. ISSN 1811-5209. ^ Albarède, Francis; Blichert-Toft, Janne (2007). "The split fate of the early Earth, Mars, Venus, and Moon". Comptes Rendus Geoscience. 339 (14–15): 917–927. Bibcode:2007CRGeo.339..917A. doi:10.1016/j.crte.2007.09.006. ^ Robinson, Eugene C. (January 14, 2011). "The Interior of the Earth". U.S. Geological Survey. Retrieved August 30, 2013. ^ Peele, Robert (1911). "Boring" . In Chisholm, Hugh (ed.). Encyclopædia Britannica. 4 (11th ed.). Cambridge University Press. p. 251. ^ Anderson, Robert S.; Anderson, Suzanne P. (2010). Geomorphology: The Mechanics and Chemistry of Landscapes. Cambridge University Press. p. 187. ISBN 978-1-139-78870-0. ^ "Structure and composition of the Earth". Australian Museum Online. Retrieved 2007-09-14. ^ Erickson, Jon (2014). Historical Geology: Understanding Our Planet's Past. Infobase Publishing. p. 8. ISBN 978-1438109640. Retrieved 28 September 2017. ^ "Team finds Earth's 'oldest rocks'". BBC News. 2008-09-26. Retrieved 2010-03-27. ^ Herald Hiesinger and James W. Head III (2006). "New views of Lunar geoscience: An introduction and overview" (PDF). Reviews in Mineralogy & Geochemistry. 60 (1): 1–81. Bibcode:2006RvMG...60....1H. doi:10.2138/rmg.2006.60.1. Archived from the original (PDF) on 2012-02-24. Condie, Kent C. (1989). "Origin of the Earth's Crust". Palaeogeography, Palaeoclimatology, Palaeoecology (Global and Planetary Change Section). 75 (1–2): 57–81. Bibcode:1989PPP....75...57C. doi:10.1016/0031-0182(89)90184-3. "Crust of the Earth" . Encyclopedia Americana. 1920. This page was last edited on 12 February 2019, at 03:27 (UTC).